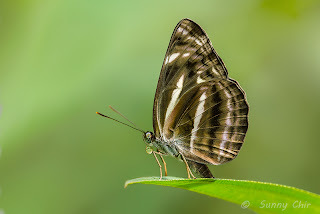 This is the third and last species of the genus Neptis that is found in Singapore, and the most uncommon of the three. The earlier two relatives, the Grey Sailor and the Common Sailor were featured earlier this week. The Chocolate Sailor adopts the flap-glide flying style like its cousins and is as skittish and challenging to approach. Only when it is distracted whilst feeding, or in this case, where it stopped to perch to rest after an active feeding session, there is a good chance for a photographer to get a good shot if it. Note that its coiled proboscis is still wet with fluids from its last feed. ButterflyCircle member Sunny Chir was at the right place and the right time when the usually active Chocolate Sailor decided to stop and perch with its wings folded shut on the leaf. The Chocolate Sailor is predominantly dark brown with lighter brown stripes across its wings in the typical Neptis arrangement. It has a distinctive crescent-shaped post-discal spot in space 3 of the forewing. Being a forest-dependent butterfly, it is usually observed in the nature reserves of Singapore. Its caterpillar host plant is Poikilospermum suaveolens and its full life history has been recorded here.